A research report that has been recently offered by Transparency Market Research states that the global market for pharmerging is likely to observe a high level of competition among the leading players over the next few years. The estimated rise in the entry of players and the growing focus of these players on technological developments are projected to enhance the growth of the pharmerging market in the next few years. Moreover, the players are likely to focus on untapped markets, which is expected to generate potential growth opportunities over the next few years. Also, the increasing number of collaborations and acquisitions are estimated to encourage the market development in the near future. 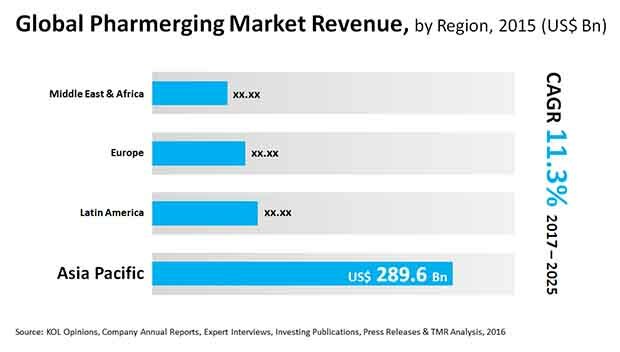 The key players present in the pharmerging market across the globe are Teva Pharmaceutical Industries Ltd., F. Hoffmann-La Roche Ltd., AstraZeneca, Huadong Medicine Co. Ltd., Tata Consultancy Services Ltd., Koninklijke Philips N.V., Merck & Co. Inc., Novartis AG, LUPIN, Abbott Laboratories, GlaxoSmithKline Plc., Johnson & Johnson, and Sun Pharmaceutical Industries Ltd.
As per the market research report by TMR, in 2015, the global market for pharmerging stood at US$552.8 mn and is predicted to reach a value of US$1.40 bn by 2024. The market is further anticipated to register a promising 11.30% CAGR from 2016 to 2024. In the last few years, Asia Pacific held a huge share of the pharmerging market and is estimated to remain in the same position over the next few years. The high rate of urbanization and the tremendous rise in investments for medical research are predicted to ensure the development of this region in the next few years. Also, the rising patent expiration and the increasing contribution from China are further projected to enhance the growth in the near future. The rapid development of the pharmaceutical industry, particularly in the emerging economies are estimated to encourage the growth of the global pharmerging market over the next few years. The extensive expenditure by the leading players for the development of drugs and the getting the approvals are predicted to accelerate the growth of the overall market in the next few years. In addition, the rising spending capacity of people in developing economies and the enhanced life expectancies, and the presence of a large pool of patients are likely to create potential opportunities in the near future. Furthermore, there has been a rise in the occurrence of non-communicable diseases, owing to which there has been a constant demand for effective drugs, thus supporting the growth of the pharmerging market in the next few years. Also, the rising and development activities and innovations in the medical sector are further expected to enhance the development of the market over the next few years. The global market for pharmerging is projected to face a few challenges, thus restricting the development of the market in the next few years. People, across the globe are cost-conscious, particularly in emerging economies, which is predicted to inhibit the growth of the overall market in the near future. As a result, many people are preferring for low-cost generic drugs resulting in a slight drop in the growth of the market in the next few years. Nonetheless, the rising awareness among consumers regarding the availability of drugs and the enhancement of the distribution network are likely to supplement the market development in the near future. The Asia Pacific market for pharmerging is likely to hold a large share of the market in the coming few years. The rising research activities in the healthcare sector to generate growth opportunities for the players in the near future.